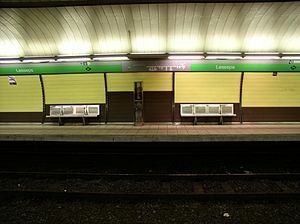 Line 3, currently known as Zona Universitària – Trinitat Nova, coloured green and often simply referred to as Línia verda ("Green line"), is a metro line in Barcelona operated by TMB, and therefore part of the fare-integrated ATM transport network of the urban region. This V-shaped line is the result of the junction of two related lines: the original L3 and L3B, in 1982. The central section of L3 has the city's oldest metro stations, built in the mid-1920s, with additions almost every decade since then. All of L3 stations are underground. Its termini as of 2008 are Zona Universitària, which serves the University of Barcelona campus located in the western end Avinguda Diagonal in the Les Corts district, and Trinitat Nova in Nou Barris. There are plans for it to be extended from Trinitat Nova to Trinitat Vella, for connection with Line 1, and possibly further south of Zona Universitària, where it would join new lines L9 and L10. Line L3 is the oldest line in the metro network, having opened in 1924 under the name Gran Metro de Barcelona with the occasion of the 1927 World Fair, joining Plaça Lesseps with Plaça Catalunya, the latter becoming the central underground station in the city and a terminus of both metro lines. It was operated by now defunct Compañía del Gran Metro de Barcelona (GMB). Nowadays it covers a V-shaped area between the west end of Avinguda Diagonal (Zona Universitària) and Canyelles as a result of the integration of the original L3 and a subsidiary line called L3B or L3bis which appeared in 1975 joining Drassanes with Zona Universitària, and which became part of a larger L3 in 1982 when the infrastructures of both joined and they became fare-integrated. A section of the original L3 disappeared as plans to extend it in that direction would have required too much effort and the construction of L4 provided coverage for the line. These former stations of L3 remain unused. 1924 – Catalunya-Lesseps section opened. 1925 – Fontana station opened. Catalunya-Liceu section opened. 1926 – Passeig de Gràcia-Jaume I section opened. 1934 – Jaume I-Correos section opened. 1946 – Liceu-Fernando section opened. 1968 – Fernando-Drassanes section opened. 1970 – Drassanes-Paral·lel section opened. 1972 – Passeig de Gràcia-Correos section closed. 1975 – Paral·lel-Zona Universitària section opened (as L3B). 1982 – L3B integrated into L3. 1985 – Lesseps-Montbau section opened. 2001 – Montbau-Canyelles section opened. 2008 – Canyelles-Trinitat Nova section opened. Station or line names shown in italics are under construction. The Barcelona Metro is an extensive network of rapid transit electrified railway lines that run mostly underground in central Barcelona and into the city's suburbs. It is part of the larger public transport system of Barcelona, the capital of Catalonia, with unified fares under the Autoritat del Transport Metropolità (ATM) scheme. As of 2014, the network is operated by two separate companies: Transports Metropolitans de Barcelona (TMB) and Ferrocarrils de la Generalitat de Catalunya (FGC). It is made up of 12 lines, combining the lines owned by the two companies. Two lines, L9 and L10 are being built at present, with both lines having different sections of each opened between 2009 and 2016. They are due to be fully completed on 2026. Three lines on the network have opened as automatic train operation/driverless vehicle systems since 2009: Line 11, Line 9 and Line 10, in chronological order. The Trambaix is one of Barcelona's three tram systems. It is operated by TRAMMET connecting the Baix Llobregat area with the city of Barcelona, Catalonia, Spain. It opened to the public on 5 April 2004 after a weekend when the tram could be used free of charge. Plaça de Catalunya is a large square in central Barcelona that is generally considered to be both its city centre and the place where the old city and the 19th century-built Eixample meet. Provença is the name of a Ferrocarrils de la Generalitat de Catalunya station located under Avinguda Diagonal and Balmes street. The station is served by FGC-operated Barcelona Metro lines L6 and L7, and Metro del Vallès suburban metro lines S1, S2, S5 and S55. Diagonal is the name of an important station in TMB-operated Barcelona Metro network. It is named after Avinguda Diagonal, where the station is located together with Passeig de Gràcia. It is served by TMB-operated Barcelona Metro lines L3 and L5, and it is also connected with FGC station. Paral·lel is a Barcelona metro station, located under Avinguda del Paral·lel, between Ronda de Sant Pau and Carrer Nou de la Rambla. It is served by L3, is the southern terminus of L2, and also the lower terminal of the Funicular de Montjuïc. Plaça de les Glòries Catalanes, most often shortened to Glòries, is a large square in Barcelona, first designed by Ildefons Cerdà to serve as the city centre in his original urban plan, but nowadays relegated to quite a secondary position. It is located in the Sant Martí district, bordering Eixample, at the junction of three of the city's most important thoroughfares: Avinguda Diagonal, Avinguda Meridiana and Gran Via de les Corts Catalanes. Currently it serves largely as a roundabout of elevated highways. However, beginning in the early 2000s, and as of 2007, revamping project for Glòries has started, which is aimed to give the square a new role in Barcelona and revitalize the northern districts of the city, under the name [email protected] These plans supplement other large-scale plans in Sagrera and the Fòrum area. The first installment of this project was the construction of the controversial Torre Agbar skyscraper. Zona Universitària is a station in the Barcelona Metro and Trambaix networks, in the Les Corts district of Barcelona. It is currently the western terminus of metro line L3 and L9. Also it's served by tram lines T1, T2 and T3. It is named after the Universitat de Barcelona campus of the same name. Lesseps is a station in the Barcelona Metro network, named after its location, Plaça de Lesseps, in the Gràcia district of Barcelona, itself named after Ferdinand de Lesseps, who was appointed French consul in 1842. The station is served by line L3. Plaça de Lesseps is a square serving as the border between the Sarrià-Sant Gervasi and Gràcia district of Barcelona, Catalonia, Spain, loosely divided in two parts. One of the most heavily transited squares in the city, Lesseps is the starting point of one of Barcelona's busiest rondes: Ronda del General Mitre, as well as being the west end of Carrer Gran de Gràcia and being crossed by a number of streets, namely: Travessera de Dalt, Avinguda del Príncep d'Astúries, Avinguda de Vallcarca, Avinguda de la República Argentina, Carrer del Torrent de l'Olla, Carrer de la Mare de Déu del Coll, Carrer de Santa Perpètua, Carrer de Maignon and Carrer de Pérez Galdós. Mundet is a Barcelona Metro station, in the Horta-Guinardó district of Barcelona, which takes its name from the Recinte Mundet, an adjacent area that now houses a campus of the University of Barcelona. The station is served by line L3. Montbau is a Barcelona Metro station, in the Horta-Guinardó district of Barcelona, and named after the nearby Montbau neighbourhood. The station is served by line L3. Vall d'Hebron is a Barcelona Metro station, in the Horta-Guinardó district of Barcelona, and named after the nearby Vall d'Hebron neighbourhood. The station is served by line L3 and is the northern terminus of line L5. Drassanes is a Barcelona Metro station located underneath Portal de la Santa Madrona, just off La Rambla in the Ciutat Vella district of Barcelona. It is named after the nearby Drassanes Reials de Barcelona, the old shipyards that are now the home of the Museu Marítim de Barcelona. It is the closest station to the Port of Barcelona and one of the network's closest stations to the sea, and is served by TMB-operated Barcelona Metro line L3. Vallcarca is a Barcelona Metro station in the Vallcarca i els Penitents neighbourhood, in the Gràcia district of Barcelona.The station is served by line L3. Francesc Macià is a Trambaix station and a projected metro station located in the Plaça de Francesc Macià, Barcelona, crossed by the Avinguda Diagonal, in the Sarrià-Sant Gervasi district. This stop is the terminal for the three Trambaix routes.